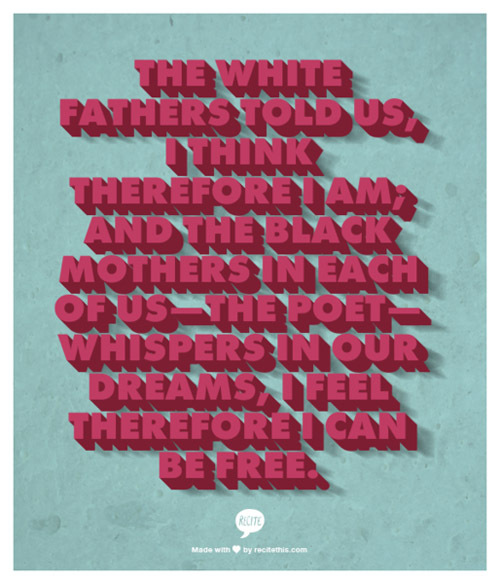 Born on this day in 1934, Audre Lorde grew up speaking in poetry. The third and youngest daughter of Caribbean immigrant parents, Lorde memorized poems and recited them when she needed to communicate a feeling or idea she couldn’t otherwise put into words. It was the fact that sometimes there was not an appropriate poem for how she was feeling that drove her to write poetry. When she was seventeen, she graduated from Hunter College High School and, after some time at the National University of Mexico, attended Hunter College, working a wide variety of jobs to support herself. Upon completion of her bachelor’s degree, she continued her education at Columbia University, earning a master’s in library science in 1961. Through the 1960s she worked at Mount Vernon Public Library, started regularly publishing her poems, got married to an attorney, became head librarian at Town School Library, served as poet-in-residence at Mississippi’s Tougaloo College, met the woman who would be her partner for nearly twenty years, and, after having a daughter and a son, got divorced. Her experiences at Tougaloo College had a tremendous impact on her writing. She published her first volume of poetry—The First Cities—in 1968, the year she made her way to Tougaloo. That volume was praised for being “an innovative and refreshing rhetorical departure from the confrontational tone prevalent in African American poetry.” Her next volume—Cables to Rage—, written during her time at Tougaloo, was not quite so “quiet and introspective;” Cables to Rage was far more outwardly focused, dealing with global issues. It was the volume that introduced the themes she would continue to address: pain, death, violence, rebirth, dishonestly, love, hope, and mourning. And, as the title suggests, it was angry—in it, she begins to plumb the depths of her anger at a society that is just action-packed with racism, misogyny, and all manner of social injustices. She published two more books of poetry—From a Land Where Other People Live and New York Headshop and Museum—before Coal, which includes a compilation of poems from her first two books, was picked up by a major publisher, W. W. Norton. Aside from having greater distribution as a larger publishing house, Norton also happened to be Adrienne Rich’s publisher. It is through Rich that Lorde was introduced to many white readers. The Black Unicorn, published in 1978 by Norton, weaves African mythology and folklore with an exploration of relationships, of motherhood, of spirituality, and also with politics of race, gender, and sexuality. 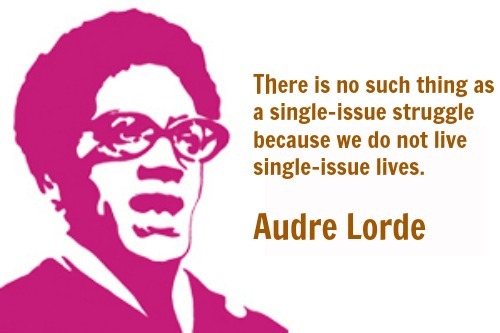 It was also in 1978 that Audre Lorde was diagnosed with breast cancer. After a mastectomy, she refused prosthesis—instead, Lorde made space for the emptiness where one breast would be and in doing so was, as Victoria Brownworth describes her, a true Amazon warrior. Her battle with cancer would turn out to be ongoing. On the heels of her experience with breast cancer, she was diagnosed with liver cancer. Nevertheless, she persisted—to borrow from more contemporary goings-on—and continued writing. Writing a letter to Mary Daly critiquing her blindspot where the perspectives of women of color are concerned. Writing and publishing works of prose discussing her journey of discovering and celebrating her identity and discussing her journey with cancer. Writing and publishing more poetry. Writing essays and delivering speeches. She also continued teaching: in 1984, she began a visiting professorship at the Free University of Berlin. Starting in 1991, she was also New York State Poet Laureate. She passed in 1992, a few months before her 59th birthday. Shortly before her death, she participated in an African naming ceremony and took the name Gamba Adisa—which means: “Warrior: She Who Makes Her Meaning Known.” I can’t imagine a more perfect name for her. 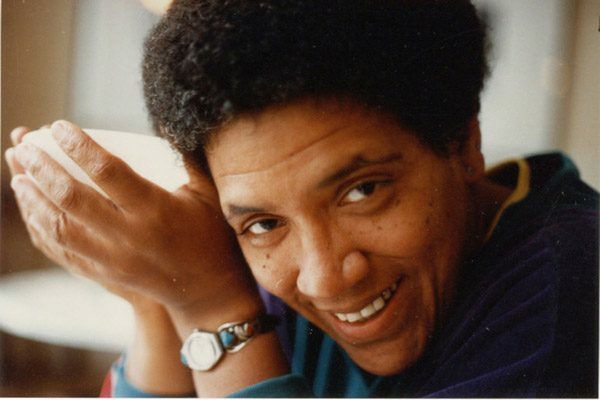 “Black, lesbian, mother, warrior, poet,” as she famously described herself, Audre Lorde pushed back at cultural demands for hegemony. She demanded the space to celebrate each and every part of her identity—an idea that extended into her creative and academic work. Lorde began probing at what would later come to be known as intersectional feminism in response to a feminist movement that disregarded her experiences of race, a Civil Rights Movement that was dismissive of gendered experiences, and a womanist movement that was exceedingly reluctant to address sexuality. 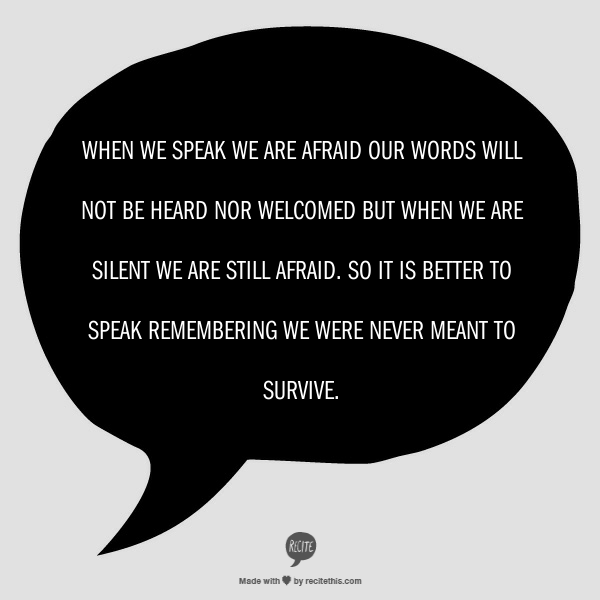 In Our Dead Behind Us: Poems, Lorde wrote, “It is not our differences that divide us. 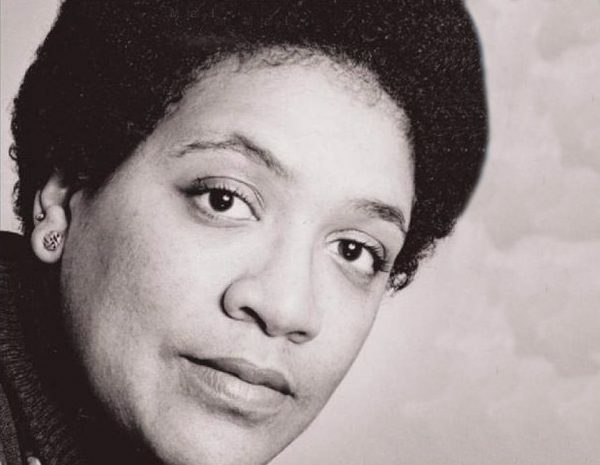 It is our inability to recognize, accept, and celebrate those differences.” So, today, on what would be her 83rd birthday, let’s celebrate Audre Lorde in all her complex, multifaceted glory!